Tin Hat makes music that explores life’s mysteries. The New Yorker has described it as “a soundtrack for the kind of puzzling dream which leaves you sitting awake in the middle of the night.” In the words of popmatters.com, their style “is like the union of a classical chamber quartet and a jazz-fusion group: elegant, technically uncompromising, and at times blistering in its fret-burning.” Everyone in the group is a great player – Carla Kihlstedt on violin and vocals, Mark Orton on guitar and dobro, Berkeley’s Ben Goldberg on clarinets, and Oakland’s Rob Reich on accordion and piano – and they’re also accomplished composers and riveting performers. The group came together in San Francisco in 1997, and has recorded seven albums, working with guest vocalists like Willie Nelson and Tom Waits. On their latest album, the rain is a handsome animal, inspired by the poetry of E. E. Cummings, Carla handles the singing, and her husky, haunting voice provides just the right vocal note to suit the poet’s evocative language. 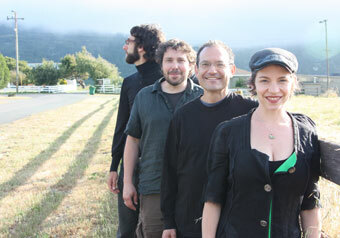 “A beautifully constructed album that reveals more with each spin,” said critic Andrew Gilbert on the California Report, praising its “art songs and folk ballads, tango flourishes and jazzy grooves.” For an evening of music that delights and surprises, nourishes the heart and tickles the mind, catch Tin Hat at the Freight.